Bask in divine aura coupled with fragrance of incense sticks, aroma of jasmine flowers, splendid architecture and above all, matchless beauty at the Temples in South India. Thronged by ardent devotees, enthusiast of history, culture and many more, these shrines present a unique spectacle to behold. Standing magnificently since ages, the beautiful temples in the southern part of the country garner attention for spiritual bliss. Besides beautiful architecture, firm faith, interesting rituals, sheer tranquility to interesting legends, there are many other reasons that will urge you to embark on a pilgrimage to these temples. 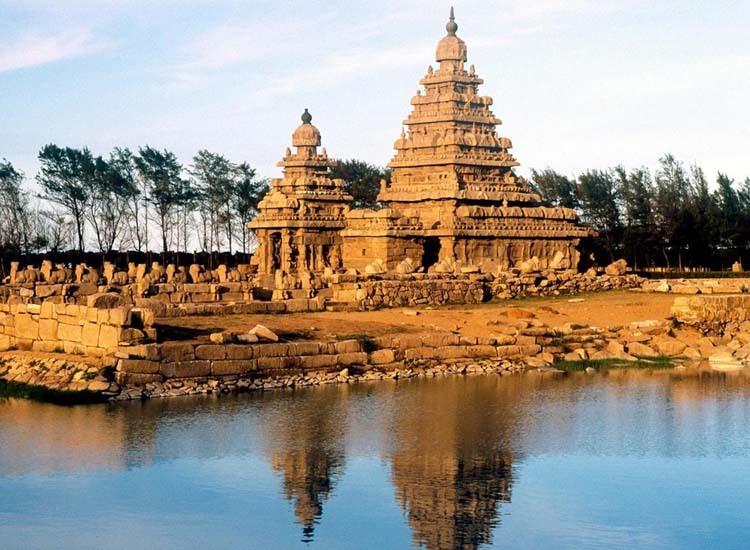 If you are confused where to start from, here’s a list of sacred shrines that you can add in your itinerary of the South India temple tours. Adorned with vibrant sculptures at its gopuram, the Kapaleeswarar Temple is a beautiful South Indian temple. The temple worships Lord Shiva and his consort, Goddess Parvati also ‘Karpagambal’ meaning ‘Goddess of the wish-yielding tree’. Pay a visit to be spellbound by the perfect confluence of two architectural styles – Vijaynagar and Dravidian. The vehicles (vahanas) within the temple consist of goat, parrot, bull, elephant, etc. A golden chariot which is used to carry idols of deities during the procession. Other temples of different Gods and Goddesses. Brahmotsavam – The annual festival takes place during the Tamil month of Panguni (mid-March to mid-April). The carnival like environment makes the entire neighborhood town alive. Panguni Peruvizha – The festival is celebrated for nine days during the Brahmotsavam and is a spring festival. Arupathimoovar Festival – An important procession. Daily rituals – The worshipping of the deity is done six times in a day. Rahu Abhishekam – It is done twice a day and additionally twice at various times in the day. Weekly rituals – Monday and Friday are reserved for the weekly rituals. During the Friday rituals, the idol of the Goddess is adorned with a garland made up of gold coins. Fortnightly rituals – They are done on pradosham. Monthly rituals – Take place on the new moon day, kiruthigai, full moon day and sathurthi. During special processions, statues of the god and the goddess are placed on a chariot which is brought out. It is considered auspicious to pull that vehicle. 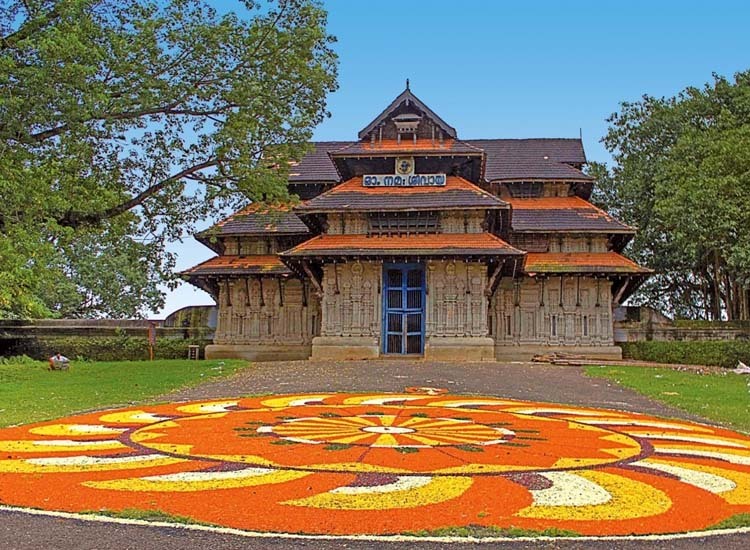 As soon as you will witness the Vadakkunnathan Temple, you will be awestruck by its unique architecture. The simple yet distinctive architecture will leave you with various thoughts running through your mind simultaneously. Not only this, the beautiful temple in South India has a lot more in store for you. Vignettes carved in wood and murals echoing episodes of Mahabharata enhance the charm of the holy shrine. Only a 16-foot-high mound of ghee decorated with thirteen cascading crescents of gold and three serpent hoods on top is visible within the sanctum sanctorum. Shrines for other deities including Krishna, Simhodara, Parashurama, Ayyappa, etc., inside and outside the premises. Nalambalam – a large white bull (Nandi) which is considered to be the vehicle of Lord Shiva. A circular structure denoting the union of the Lord and his consort. Mahashivratri – Wedding day of Lord Shiva and Goddess Parvati. i.e., Mahashivratri is celebrated with great enthusiasm in the temple. Nearly one lakh temple lamps are lighted and many cultural and musical programs are organized. Aanayoottu – The festival includes feeding of elephants. Since elephants are considered to be an incarnation of Lord Ganesha by the devotees, it is considered lucky to feed them. The festival takes place usually in the month of July. Thrissur Pooram – Held in the complex of the shrine, Thrissur Pooram is worth watching. There is a timing fire every time the nada opens. Abhishekam – This takes place daily with the ghee. Pooja – Take place three times a day. Nataraja and Vasukisayana are the two murals that are worshipped regularly. The offering of Appam to Lord Ganesha is considered important. 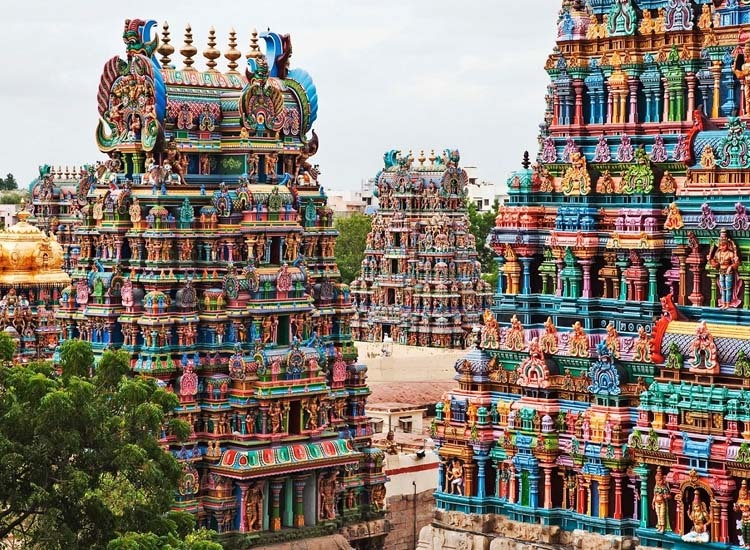 Reckoned as one of the most-visited temples in South India, the Meenakshi Amman Temple boasts of breathtaking beauty, splendid artwork and scintillating architecture. 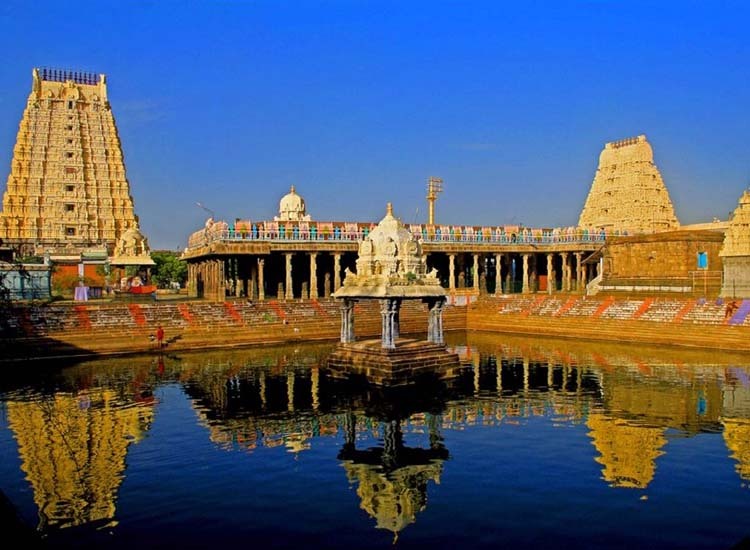 Exploring this crown of Madurai is a cherished experience. Right from the façade to the sanctum sanctorum, nothing is short of a marvel. The architectural brilliance of artisans of the bygone era who designed the sacred shrine inspires awe in all. Chithirai Festival – The festival marks the marriage of Goddess Meenakshi with Lord Shiva. Meenakshi Tirukalyanam Festival – during the annual 10-day fiesta a chariot procession is carried out. It is considered sacred to take a bath in the lake before entering the sanctum sanctorum. A ritual procession is carried out every evening before the temple closes. This is led by drummers. A brass ensemble carries the image of Lord Sundareswarar to Goddess Meenakshi’s bedroom. Every morning it is brought back to the sanctum. Puja ceremonies are done daily and during festivals. In a day, Pooja is done six times. Each comprising four rituals. 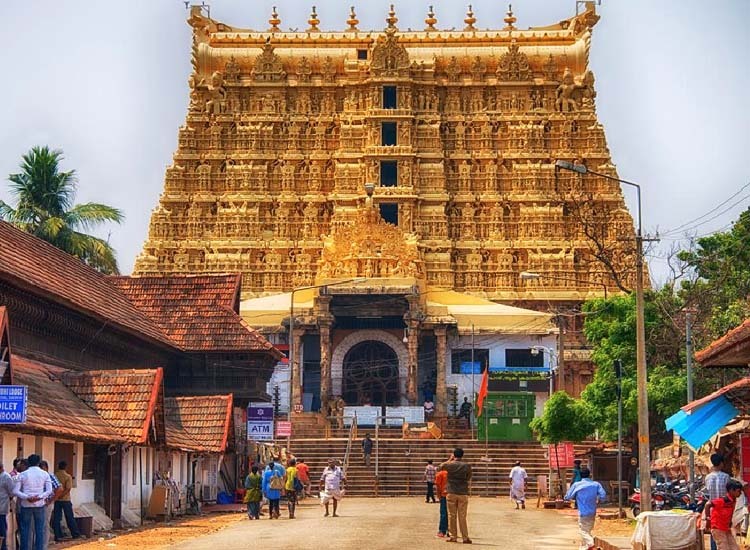 Shrouded with many mysteries, behind the doors the Sree Padmanabhaswamy Temple appears on top in the bucket-list of avid pilgrims. 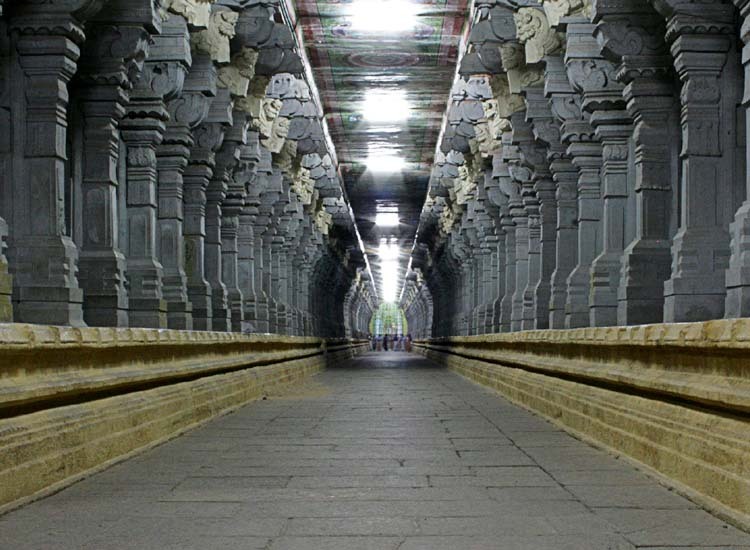 Counted as one of the richest temples in South India, the shrine is a treasure trove of bountiful wealth. The idol of Lord Vishnu enshrined in the temple depict the ‘Anantha Shayanam’ posture i.e., the eternal yogic sleep on the serpent Adisheshan. However, besides this, the six hidden vaults has always remained the center of attraction. The deity is made from 12,008 saligramams. The platform where the deity rests and in front of the vimanam is called as the Ottakkal-mandapam as they are carved out of single massive stone. 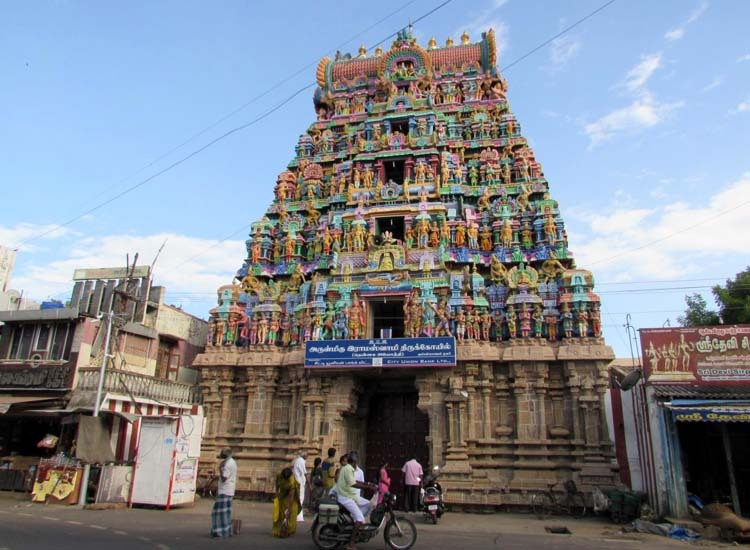 The gopuram of the temple is 100-foot high, has 7-tiers and is designed in Pandyan style. Thiruvambadi and Thekkedom are two of the many highlights in the shrine. Padma Theertham (lotus spring) is a tank by the side of which the temple stands. An 80-foot flagstaff standing in front of the main entry. Elaborate carvings on the 365 and one-quarter sculptured granite-stone pillars in the corridor. Laksha deepam – Laksha deepam is the biggest festival in the temple and translates into one lakh lamps. The unique fiesta is celebrated once in six years. Recitation of three Vedas and chanting of prayers is done for 56 days prior to the festival. One lakh oil lamps are lit in and around the temple premises on the last day. Alpashy Festival – Celebrated for ten days, the festival falls in October/November. Painkuni Festival – One of the major festivals, Painkuni is celebrated in the months of March/April. Lasting for ten days, the gala commences with Kodiyettu – the hoisting of the ceremonial flag. Navaratri Festival – Cherished for nine days, the festival is celebrated with great zeal. The Swathi music festival is organized every year during the festival. Flowers are used to worship the deities daily. The prostrate on the “Ottakkal Mandapam” or sashtanga namaskaram can be done only by the King of Travancore. Anybody who prostrates on the mandapam has to surrender all that he possesses to the deity well in advance. Perched on a hilltop, the Venkateswara Temple enjoys fame for a number of reasons. Seek the blessings after climbing 4000 steps to reach the shrine. Unfathomable riches donated by pilgrims, make the temple rank amongst the richest temples in South India. Also, known as the Tirupati Balaji temple, the holy place portrays beauty which is beyond description. Genuine hair on the statue of Lord Vishnu. The gushing sound of the sea can be heard from the back of Lord’s statue. It is believed that there is a presence of a waterfall behind Lord Balaji’s statue. Three entrances which lead to Garbhagriha. Gold gilt plates depicting the Dasavataaram of Vishnu adorn a thick wooden door. Brahmotsavams – Occurring in the month of October every year, the nine-day festival is eagerly anticipated. Rathasaptami – Starting from early morning to late night, the processional deity (Malayappa) of Lord Venkateswara is taken in a procession around the temple on seven different vehicles. It is celebrated in February. Vaikunta Ekadashi – Celebrated during February, the fiesta is the day on which it is believed that Vaikunta Doors will be opened. As per the pundits of the temple and Brahmins, during Nija Roopa Darshanam on Thursdays, a white wood glue is applied on Lord Balaji’s statue. When the adhesive is removed, there remains the engraving of Goddess Lakshmi. This adhesive is then sold by the temple. Every single flower used to adorn the Lord’s venerated image is then tossed in the waterfall which is supposed to be present at the back of the statue. The Tirupavada Seva is organized on Thursday where food offerings are made to the Lord in the form of naivedyam. Daily, weekly and periodical rituals are conducted in the temple. 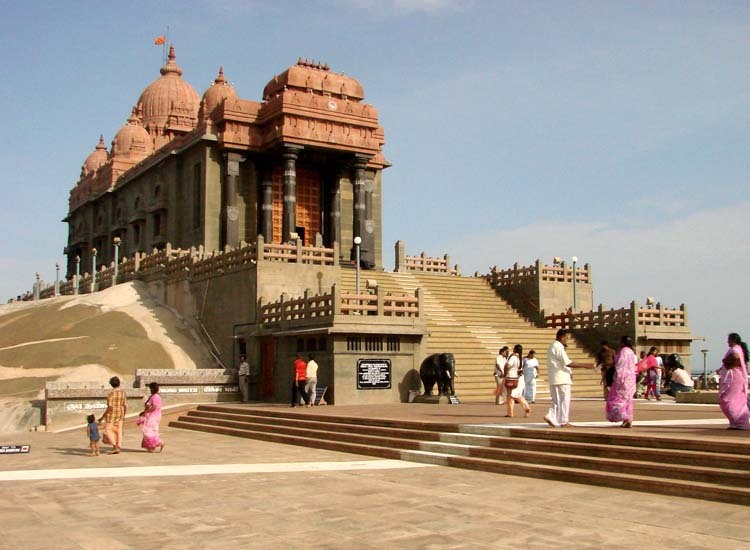 Overlooking the majestic seashore of Kanyakumari, the Kumari Amman Temple is par excellence. Believed to be 3000 years old, the sacred place has many legends associated with it. The presiding deity is worshiped here as the Virgin girl and there is a mesmerizing statue of her within the sanctum sanctorum. The temple finds its mention in various ancient scriptures. Also, the pious place is counted as one of the 51 Shakti Peeths of the Goddess. Patal Ganga Teerth – Place from where the water for the Abhishekam of Devi is fetched. The nose ring of Devi Kanyakumari is set with rubies which sparkle so brightly that they are mistaken for the light coming from a lighthouse. Dhwajastambha – The flag mast. Navratri – Music artists perform during the nine-day festival celebrated in the month of September-October. The 10th day is called as the Vijaya Dashmi which marks the killing of Banasura. A procession is carried out which takes the image of the deity on a silver horse to the place of the festival. Kalabham Festival – Statue of the Goddess is smeared with sandal paste on the last Friday of the Tamil month. Vaisakha Festival – The festival is celebrated for 10 days and the procession is carried out both in the morning and evening. The idol of Devi is taken for an excursion in the town. The eastern door of the temple is opened on Aaraatu. The Goddess is taken round the water on the western part in a boat on the ninth day. Except on some festivals, the eastern gate of the temple remains closed. It is opened in Navratri, new moon days in the months of Karkkidakam and Edavam and Vaiskha. Daily five poojas are done in the temple. Home to beautiful idols of Lord Rama, Goddess Sita, Lord Lakshmana and Lord Hanuman, the Ramaswamy Temple dates back to the 16th century. The shrine is distinctive because of being the only temple where one can see Lord Rama with his younger brothers Bharat and Shatrughan. The holy place is considered as the southern Ayodhya. The sacred shrine is nothing less than a great art gallery. The smaller idols are considered to be very old and found within the ground. Famous stone carvings enhance the beauty of the columns of Maha Mandapam. Each and every pillar in the temple is carved out of a single stone and portrays very prominent delicacy. Shri Rama Navami – The day on which Lord Rama was born. It usually falls in the month of March/April. Masi Maga – On this day, Lord Ram along with his consort visit the Maga Magam Temple tank for taking a bath and then the Prasad is offered to the devotees. Three pradakshinas (rounds) of the sanctum helps one to understand the Ramayana pictorially. Daily pooja is done six times. The temple is thronged by people who are facing difficulties in getting married. 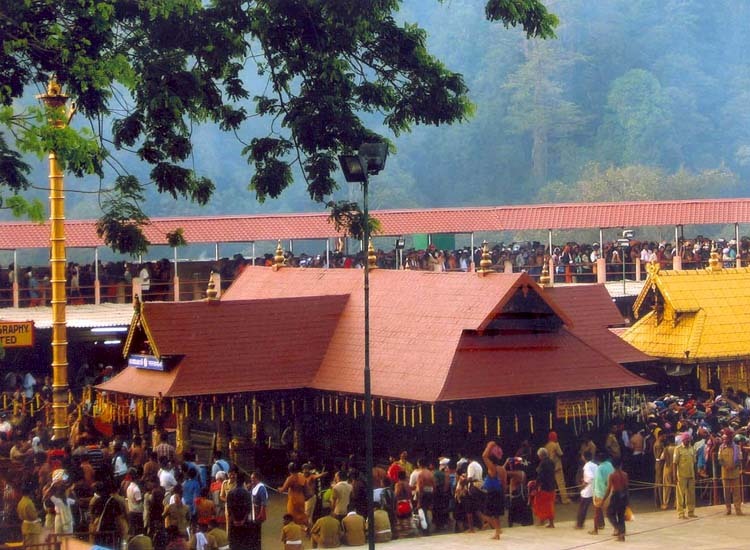 Visiting Sabarimala Temple is not easy but the shrine is one of the largest annual pilgrimages in the world. Alluring over 100 million devotees every year, the temple offers amazing spiritual experience. The exquisite décor is simply breathtaking. As for now, only men and ladies falling between the age group 10 and 50 are allowed within the shrine. The men who want to visit the Sabarimala Temple have to undergo fasting for 41 days following strict rules. Manimandapam – The place where the prince of Pandalam dynasty meditated. The main temple – Nestled amidst 18 hills, the main shrine is perched on a 40-feet high plateau. Idol of Lord Ayyappa – The idol of Lord Ayyappa is made up of panchaloha i.e., the alloy from five metals and is one and a half feet high. Pathinettu thripadikal – The 18 sacred steps which lead to the sanctum sanctorum and are climbed by the devotees who come after undergoing 41 days of Vratam. Makara Vilakku – The day when Lord Rama met Sabari, his true devotee and Shasta. Also, on this day, Lord Dharmashasta stops his tapasya to shower his blessings his followers. It is also celebrated as Makar Sankranti. Ulsavam – The temple remains open during the 10 days festival which usually falls in March/April. Sabarimala pilgrims have to wear only black or blue dress. Shaving of head and cutting of nails is prohibited till the completion of pilgrimage. They also smear Vibhuti or sandal paste on their forehead. No pilgrim without “Irumudikkettu” can ascend the 18 sacred steps. The temple opens up for worshipping for a specific duration on special days which are Makaravilakku, Mandalapooja, Maha Vishuva Sankranti and he first five days of each Malayalam month. Before closing the door every night, the Harivarasanam is recited. Many devotees still follow the traditional mountainous forest path. Pouring sacred ghee brought by pilgrims on the idol is an important ritual. Inscribed on the list of UNESCO World Heritage Sites, the Shore Temple is one of the must-visit temples in South India. Carved out of granite, the shrine enjoys a stunning location. The backdrop of the Bay of Bengal makes the temple look spellbinding during the sunsets. Two small and one main shrines collectively are known as the Shore temple and house more than 100 sculptures. Garbhagriha – The sanctum sanctorum enshrining the sacred Shivalingam. The internal side of the boundary wall and the exterior wall of Lord Vishnu’s shrine are elaborately carved and sculptured. Anantashayi Vishnu – A small rectangular shrine preserves the statue of Lord Vishnu in reclining postures. A miniature shrine – Recently discovered, the site houses the image of Bhuvaraha in a well-type enclosure. A monolith sculpture of a partly carved and partly sculpted lion. The temple serves as the backdrop for the following two important festivals in India. Since the temple is not a living one, no special rituals take place here. With its high rise Gopurams dominating the skyline of Kanchipuram, the Ekambareswarar temple is a vast and an ancient shrine. The holy site is reckoned as one amongst the other to be associated with the five elements, the Pancha Bhoota Stalas. Interestingly, no separate shrine exists here for Goddess Parvati and she is revered as the Gowridevi Amman. Many legends of Lord Shiva and his consort keep on reverberating within the premises of the temple. The temple has four gateways towers. Southern tower is the tallest one with a height of 55m. This makes the shrine one of the tallest temple towers in India. There is Nilathingal Thundam Perumal temple, a Divyadesam. The temple houses a thousand-pillared hall. 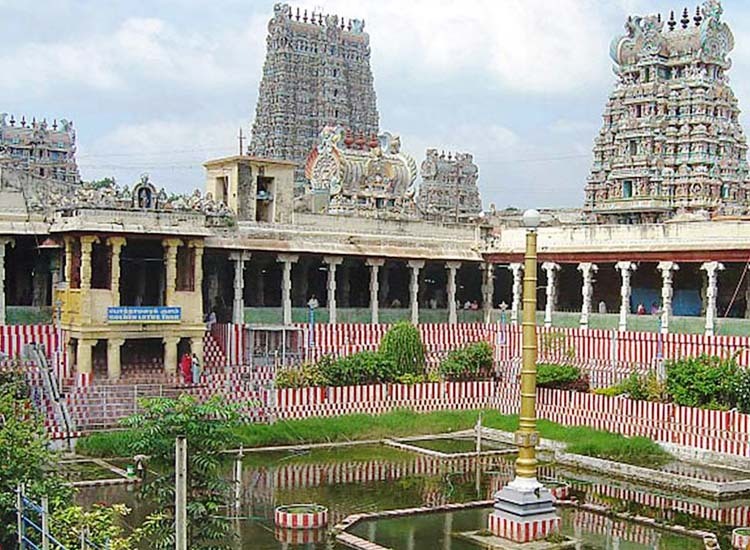 Valeesam, Thirukachi Mayanam, Satyanadeesam and Rishabesam are located in four corners of the temple. Intricate figures on the sculpted pillars portraying various incarnations and legends of Shiva. A shrine of Nataraja on the second precinct. Although a dozen festivals is celebrated in the temple throughout the year but the Panguni Uthiram festival. The fiesta falls in the month of March or April, lasts for thirteen days and is celebrated with great zeal. Daily six rituals take place in the temple. On Monday and Friday, weekly rituals are performed. The rituals take place amidst sounds of various musical instruments and recitation of various religious instructions in Vedas by the priests. Monthly rituals are conducted on full moon day, new moon day, kiruthigai or on krittika nakshatram and chathurthi. The fortnightly rituals are on pradosham. Boasting of architectural brilliance of craftsmen of the yesteryears, the Ramanathaswamy Temple is worth visiting. The sacred pilgrimage attracts millions of tourists every year. Counted as one of the twelve Jyotirlinga temples, the shrine houses the lingam of Lord Shiva which is believed to be worshipped by Lord Rama himself. The temple also holds a special place in the heart of Hindus because of its destination. The site where the temple is situated is considered as one of the pilgrimages of the holy Char Dham Yatra. There are two lingams, one is made by Goddess Sita and the other one was brought by Lord Hanuman. The temple has a hall of 1212 pillars. The Rajagopuram or main tower is 53m tall. 22 tanks and wells are considered to be pious and thus it is important for devotees to take a holy dip in them before entering the sanctum sanctorum. Separate shrines for other deities are also a significant part of the main temple complex. The shrine is home to longest corridors in the world. Shivratri – The festival is celebrated for 12 days and marks the day when Lord Shiv got married to his consort Goddess Parvati. Rama Linga Prathista – The festival falls between June and July. Spring Day – Also known as the Vasanthorchavam, the fiesta lasts for ten days. Thiru kalyanam – Celebrated for seventeen days, the festival takes place during July-August. As per the directions of Lord Rama, the lingam which was brought by Lord Hanuman is worshipped before the one made by Goddess Sita. Worship is done eight times a day. Every Thursday, a Pooja is conducted known as the Dhakshina Moorthy. Somavara Pooja is carried out on every Monday. The temple conducts weekly Navgraha Pooja on every Saturday. It is on every Friday that the Ambal procession is carried out within the third corridor. An array of sandstone temples are collectively called as the Bhuthanatha group of temples. 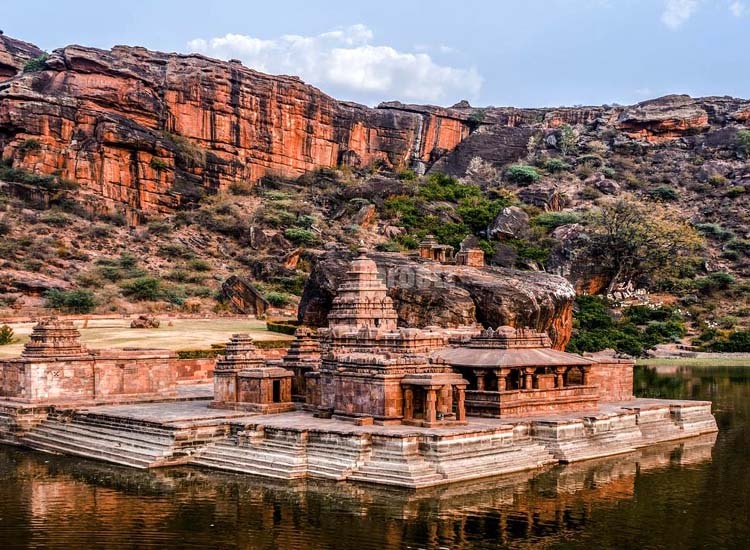 The temple on the north-east side of the lake is called as the Mallikarjuna group of temples whereas the one on the east side of the lake is called as the Bhuthanatha temple. The shrine is one of the earliest examples of the structural temples in South India. Architectural forms from different periods adorn the complex of the shrine. Lotus designs on the pillars of the inner hall of the Bhutanatha Temple. Goddess Ganga adorns one side of the doorway while on the other side stands River Yamuna. The outer hall of the Bhutanatha Temple showcase the style of the Kalyani Chalukyas of the west and the inner hall reflect the style of the Eastern Badami Chalukyas. No major festivals are celebrated here. No rituals take place here. 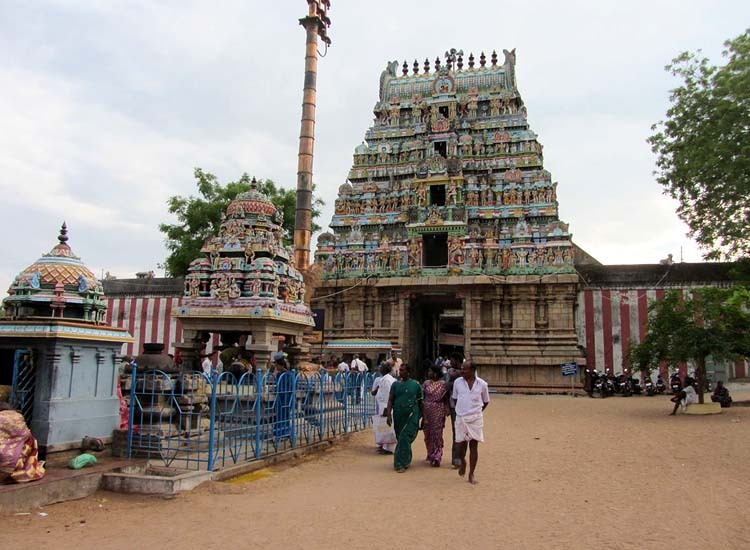 The Naganathaswamy Temple is one of the nine Navgraha Temples. As per folklores, Rahu (one of the nine planets) worshipped Lord Shiva at the holy shrine. Although the presiding deity is Lord Shiva, Lord Rahu also bestow his grace to the devotees here. He dwells within the sanctum sanctorum with his two consorts Nagakanni and Nagavalli. However, Lord Shiva is accompanied with his consort Goddess Parvati. Interestingly, the shrine is also known as a Rahu Stalam. The temple has an idol of Lord Rahu with a human-like face, unlike other temples where the Lord owns a face of a serpent. The Mandap of the shrine is designed like a temple car. There are huge prakarams and towering gopurams in the temple. A separate shrine for Goddess Girigujambal is worth watching. Lord Rahu resides in a separate shrine within the temple complex. Other exclusive temples also adorn the complex. Sula Theertham is a holy temple tank. A hundred pillared hall adorn the shrine. Brahmotsvam – A major festival which is celebrated for ten days in the month of November–December. During the fiesta procession is carried out in silver vehicle to mark the marriage of Lord Shiva with Goddess Parvati. Shivaratri day – Lords Rahu pleased Lord Shiva on this day. Kandasashti festival – Falling in October or November, the festival lasts for six days. It is believed that son of Shiva killed a demon on this day. Navaratri Festival – Cherished for nine days, the festival concludes with Vijayadashmi marking the victory of good over the bad. Rahu Peyarchi – The festival is celebrated once after every 1.5 years. The most important ritual which gathers lots of devotees is the Milk abhishekam. It is the ritual when the milk turns blue as soon as it is poured on the idol of Lord Rahu. This is visible to everybody. Performing milk abhishekam during the Rahu kalam gives solutions to various problems being faced by the humans. Six daily rituals are performed daily. A holy dip is taken in the holy temple tank removes away all the sins. The list of temples in South India is endless. Embark on the spiritual sojourn and soak in the divine bliss.